(SPOT.ph) Something strange happened on Facebook on October 11. One by one, a handful of celebrities started switching their profile photos with adorable cartoon versions of themselves. In doing so, these Unilever endorsers showed their support for Unilever’s Shop2Give campaign. From her lob to full lashes, you just know, it’s Sarah G.
Those pink lips are definitely Nadine’s. Just when you thought James Reid couldn’t get any cuter. Kathryn’s bangs and soft curls come to life here. This drawing captured Rachelle Ann’s chinita eyes, too! Our favorite part of this drawing would have to be Yassi’s baby hair. They captured Elisse’s voluminous blowout. Julie Ann transforms into gypsy Esmeralda here, down to the hoop earrings. So adorable that the young illustrator got the center part, outfit, and her defined jawline spot-on. Subtle smile and wavy hair, check! So, what was all this cuteness about? It was to spread awareness for the LazMall Super Brand Day with Unilever, which happened last October 17. 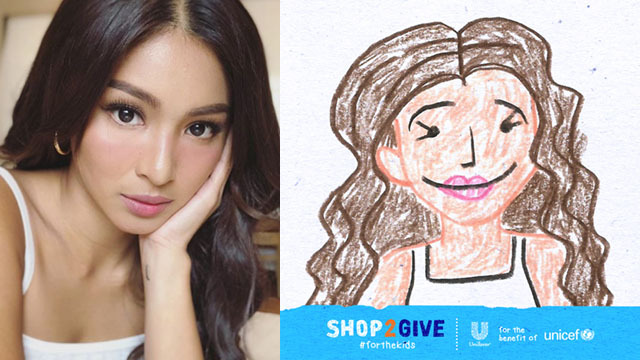 Shop2Give was a 24-hour shopping event in Lazada where shoppers scored discounts of up to 80% off from Unilever brands. Special offers were available for products from TRESemmé, Pond’s, Cream Silk, Dove, Closeup, Rexona, and Selecta. These brands also changed their Facebook photos to cartoon versions of their logos and campaigns. For every purchase, a donation was made for the children of UNICEF. Those who purchased products with the “Buy One, Give One” tag were able to donate the same items to UNICEF. Exclusive bundles with a limited edition Shop2Give tote bag were also available. UNICEF does not endorse any company, brand, product, or service.